Salt Lake County program gives women from the Sudan, Iraq and the Congo a chance to use their well-honed cooking skills to help pay the bills. Al Hartmann | The Salt Lake Tribune Muna Ali, a Sudanese refugee who has lived in Utah for 9 years, prepares African dishes for a catering event. 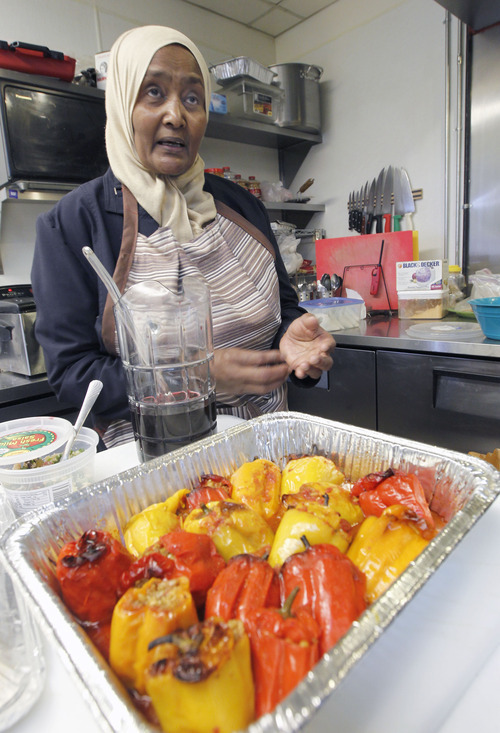 Salt Lake County is fostering a growing refugee catering business called The Ethnic Kitchen Alliance. The program is helping unemployed, female refugees earn income from their skills as cooks. Al Hartmann | The Salt Lake Tribune Muna Ali, a Sudanese refugee, drops triangles of dough-wrapped meat and vegetables into oil this week. The sambousas were part of the lunch she was catering for a Utah Department of Health event. Al Hartmann | The Salt Lake Tribune Muna Ali, a Sudanese refugee, cooks food at Mahider, an Ethiopian restaurant this week. She was preparing dishes as part of her growing catering business, which has grown with the support of a Salt Lake County program. 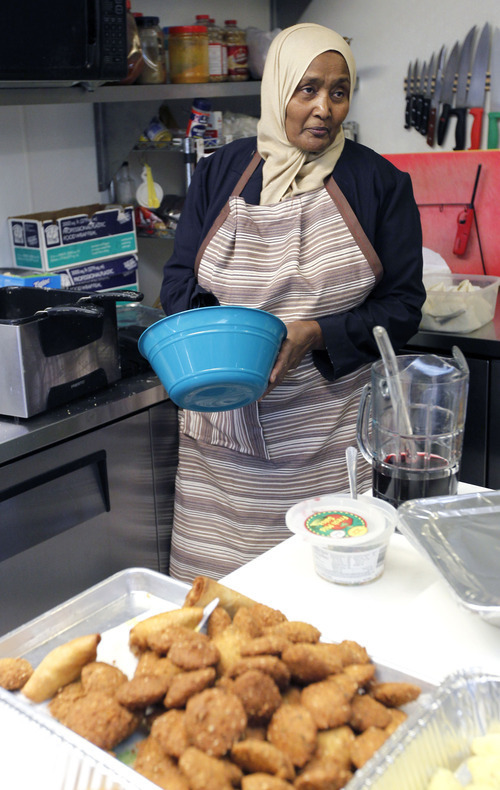 Al Hartmann | The Salt Lake Tribune Muna Ali stands in the kitchen of Mahider, an Ethiopian restaurant, where she was preparing food for a catering event this week. The Sudanese refugee is part of a Salt Lake County refugee catering program that has exploded this year. She is required to cook in a commercial kitchen. After raising nine children, Muna Ali discovered a new way to keep occupied: the crispness of chicken sambousas, the spice of tabbouleh and the nutty sweetness of baklava. For years, she wanted to start a restaurant, but refugees like her, with limited education and capital, find that dream hard to realize. 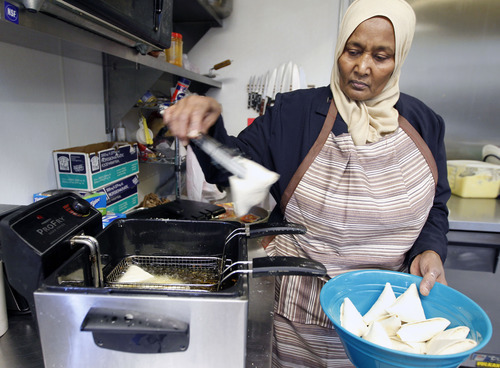 Now Salt Lake County is guiding her and two other refugee women toward small business success as their fledgling catering businesses explode. "It's growing so fast I don't know if I could manage it any longer," said Ze Min Xiao, the county's refugee services liaison. The 2-year-old Ethnic Kitchen Alliance gives the women from the Sudan, Iraq and the Congo a chance to use their well-honed cooking skills to help pay the bills. "I [don't] have high education to work like you," Ali said last week as she prepared lunch for a Utah Department of Health retreat. 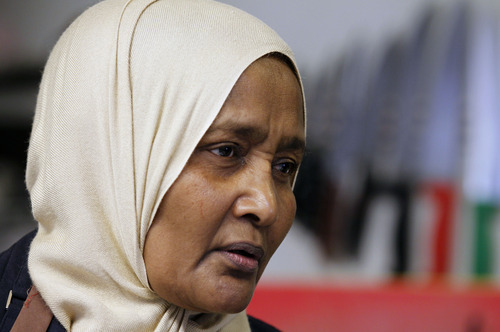 She attended elementary school and married in north Sudan at 12. By 14, she had her first baby. After arriving in Utah nine years ago, she helped care for her grandchildren and neighbors' children. But she always wanted more to do. "I want to make myself busy," the 65-year-old said. Refugees, who are legal immigrants, arrive in Utah by the hundreds each year. Employment can sometimes be elusive. Some are illiterate in any language. Their English skills may initially be nonexistent. But the U.S. refugee program is geared toward self-sufficiency, so adults are expected to become wage earners as soon as possible. About half of the refugees who are resettled in Utah through Catholic Community Services find work within six months. Those jobs are often in housekeeping, janitorial, laundry and similar fields. One of the county's goals is to help refugees draw on their current skills, which for many women includes cooking delicious food. The county takes orders for the women, helps with invoicing, marketing and scheduling while making sure the cooks have the adequate permits and facilities to prepare the food. They have to cook in a commercial grade kitchen such as the Horizonte Instruction and Training Center, not at home, and have a food handler's permit. And Xiao has to remind Ali not to be too generous with her homemade creations. "You need to make sure you make money," she reminded the refugee. But money isn't always foremost for these newcomers. "It's not the profit she's caring about first thing," said Hiba Omar, 20, Ali's daughter and a University of Utah student. "It's her customers." Now officials hope to develop a business resource center for refugees that could provide training and coordinate information, whether someone wants to sell ethnic foods and traditional crafts or start a day care. They're also seeking funding to hire someone to manage the growing catering business. "For someone who hasn't been exposed to a lot of the Western way of doing business, it's difficult," said Xiao. "In another country you can set up a booth in the middle of the street and sell food." The three refugee women hope to open a restaurant one day, including Cathy Tshilombo-Lokemba, a refugee from the Congo. Her signature hot sauce is already sold in places such as Tony Caputo's Market & Deli. Since coming to the U.S. 16 years ago, she's had jobs everywhere from the post office to Walmart. "Something was just telling me, 'Cathy, you are not at the right place,'" she recalled. "Something inside me was like, 'You can do better than this.'" She dreams of opening a small shop and restaurant with a factory in the back to make food for sale. Some African immigrants continue to order food from home, such as smoked fish, which she thinks could be prepared locally while simultaneously creating jobs. It makes sense to her that refugees, particularly women, would turn to food businesses for survival. "That's what you can do best with your hands," Tshilombo-Lokemba said. "You do what you have inside your blood." Would you like to hire a caterer from the Kitchen Alliance for your event? Call Ze Min Xiao (Zee) at Salt Lake County at 385-468-4861 for Iraqi, Congolese and Sudanese catering.